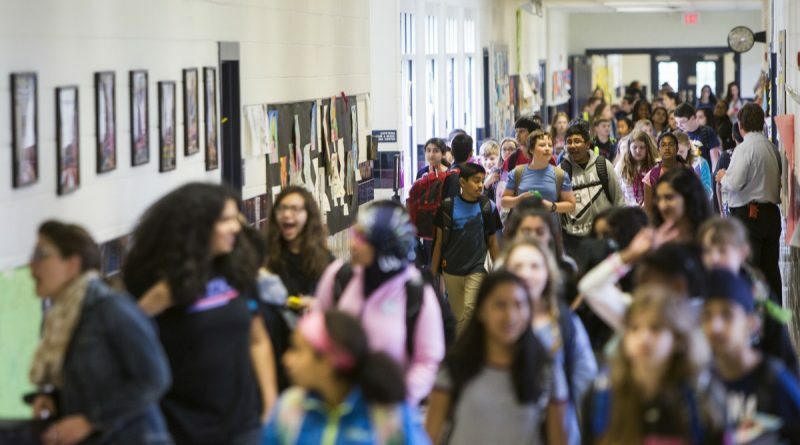 For a second time in the county’s history, Loudoun will operate an intermediate school to get over an enrollment hump until a new high school can open. The Loudoun County School Board on Tuesday night adopted new attendance boundaries that reassign hundreds of secondary students in preparation for the opening of a new middle school (MS-7) in 2018 and a new high school (HS-9), set to open in either 2020 or 2021. And, as part of shifting school assignments, the board also approved a big move designed to provide much-needed relief to crowded schools in the Dulles South area. They agreed to open MS-7 in 2018 as an intermediate school, housing grades eight and nine, while sixth and seventh graders attend Mercer Middle School, and 10th through 12th graders attend John Champe High School. If county supervisors and School Board members can accelerate the construction of HS-9, to open it in 2020, then the intermediate option would be used for two years instead of three. “I don’t see that it’s possible to not use the intermediate school solution,” School Board Jeff Morse (Dulles) said of the out-of-the-box option. On the boundary changes, board members agreed on how the attendance lines should be drawn south of Rt. 50—that students living south of Rt. 50 should attend schools south of that major roadway—but there was disagreement on boundaries in the Brambleton area. The board voted 8-1 to adopt Plan 8, drafted by Morse. The plan keeps students living in the Belle Terra community at Eagle Ridge Middle School/Briar Woods High School. An alternate proposal, Plan 7, drafted by Chairman Eric Hornberger (Ashburn) would have reassigned those students to Stone Hill Middle School/Rock Ridge High School. Joy Maloney (Broad Run), the lone vote opposing Plan 8, said she favored Plan 7 because it would have dropped enrollment at Eagle Ridge Middle School and Briar Woods High School. Board members who backed Plan 8 said they think, in the coming years, every available seat will be needed at Stone Hill Middle School and Rock Ridge High School, especially as Metro’s Silver Line draws more residents. Plus, projections show enrollment declining at Eagle Ridge and Briar Woods. See details of the adopted plan here. Once again, Maloney and Hornberger show undisguised favoritism toward their district. Many board members look to the good of the county in these decisions. Not Hornberger. He even sold out his own constituents (Lansdowne) to protect his more preferred neighborhoods back in 2012 due to “overcrowding” at Seldens Landing. Today, Seldens is 10% under capacity and its enrollment was declining even in 2012. Fortunately, enough citizens spoke up for the board to understand their actions were being judged. If you keep speaking up and paying attention, maybe Hornberger and his “band” won’t be able to get away with as many shenanigans.